These Shears are great! If you need kitchen shears these are the heavy duty shears you have been looking for at a great price. These are Heavey Duty Kitchen Shears with 8 Features: Bone Cutter, Fish Scaler, Vegetable Peeler, Herb Striper and so much More. Opening bottles and cracking nuts are two common needs in the kitchen and are two functions included in this kitchen shears. 1 xMultifunction Kitchen Shears. Why You Should Get a Kitchen Shears?. Besides a beautiful finish, Super Sharp Blades. Quail Egg Scissors, Also used for Cigar Cutter. 1 x Quail Egg Scissors Cigar Cutter. You'll make quail eggs "the favorite" for daily consumption and. The perfect tool, especially designed to easy and clean cut of the quail egg shells. The sharp stainless steel blades are ideal for trimming and cutting poultry, and the blades are curved and tapered to access hard to reach places. The handle loop and bolster prevent your hand from slipping forward while cutting. Professional 9.5" Kitchen Stainless Steel Shears Poultry Chicken Bone Scissors. 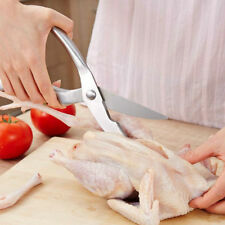 Design has the shear for poultry, Easy to cut. Multifuctional, cut chicken bone, fish,crab easily. 1pc x Stainless Chicken Bone Scissor. Snip, crack or de-vein a variety of shellfish with these RSVP Endurance seafood scissors. You will want these for shrimp, oysters, crabs, lobsters and more. Snip, crack or de-vein a variety of shellfish, mud puppies, crayfish crab, lobster and more. Professional Kitchen Shears 9.5" Stainless Steel Poultry Chicken Bone Scissors. VERSATILE, MULTI-TASKING TOOL: A perfect combination of a culinary shear and utility scissor in one. These Kutler Kitchen Shears can tackle many household tasks with ease. Use as a bottle opener, herb stripper, nut cracker and more! Blade Material: Stainless Steel. Color: Black. Stainless Steel kitchen Shears are made from high quality corrosion resistant stainless steel, ensuring they are going to last longer than others. also van be used as bottle opener,nut cracker and fish scale remover. 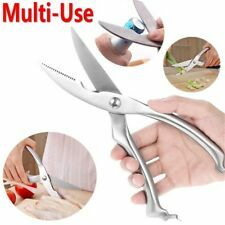 Professional 9.5" Kitchen Stainless Steel Shears Poultry Chicken Bone Scissors Humanity design handle ensures a secure, non-slip grip. Multifuctional, cut chicken bone, fish,crab easily. The concave position uses for cutting tree shape object and cartillage objects,such as chicken foot bone.such as chicken fish stomach, shark fin ect. Polished ergonomical handle prevents hand strain and keep perfect balance. Unique designe make the blade can be locked that improve safety. built-in spring, serrated cutting edge and bone breaking notch, make easy work separating bone and cutting cartilage objects. Design has the shear for poultry, Easy to cut. 8-IN-1 Multi function: Not just a pair of scissors! 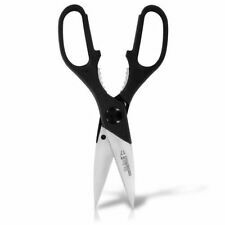 Ideal Kitchen Premium Quality heavy duty scissors can be used as the following. BONE CUTTER. SERRATED KNIFE. NEW SOLID WATER REPELLANT BATHROOM SHOWER CURTAIN LINER CLEAR ALL COLORS (#222251438379). It also has a nut cracker and a bottle or jar opener. NewDiamond Cut® Multi-Purpose Kitchen Shears. Nut Cracker. Better yet, have a pair of shears handy in the kitchen when you need to cut open one of those sealed bags of frozen vegetables. They want you to buy boxes of brownies and cake mixes for the rest of your lives, so they can not afford to send you “piece of junk” scissors! If they were not great scissors you would have bad thoughts when you pick them up and therefore be less likely to buy their frosting mix or cup cakes, or, well, you know! These shears cut through lobster, crab and shrimp shells with ease. Includes a steel-toothed grip for breaking off claws. The red handles will add a pop of color to the table at your next lobster or crab bake! 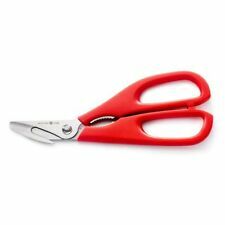 Ideal shears for effective floral pruning. High quality spring enhances speed and performance. Cushioned grip handles. Spring loaded handles. DOUBLE ENDED REFLECTOR & SYSTM. Suitable for left & right hand use. Have used this for herbs and small peppers while making salsa/guacamole. Still seems to work fine as intended, so I can't complain. The Utopia’s Kitchen Scissors can improve your herb cutting experience effectively. Fine stainless steel construction affords maximum corrosion resistance. Durable POM handles ensure this tool will last for many seasons of hard use. SUPERIOR QUALITY DESIGN - Your kitchen shears made of the highest quality stainless steel that is ergonomically designed for right and left handed individuals. RSVP International Stainless Steel Seafood Scissors. 7 in 1 Multipurpose Kitchen Scissors: The kitchen scissors performs well with it’s ultra sharp blades and highly precise cuts in almost all kitchen tasks. Opening bottles and cracking nuts are two common needs in the kitchen, with this scissors you don’t need an extra pair. 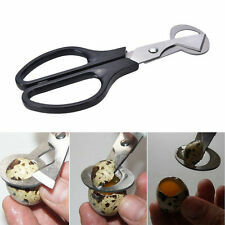 Special accessory for cutting quail eggs. Our Stainless Steel 5 Blade Multipurpose Herb scissors with Easy Cleaning Comb and Protective Cover. Perfect tool for working with quail and other small eggs. Designed especially to make clean cuts through small, hard quail eggs. Stainless steel and plastic. This shell cutter works cleanly, removing the top of the egg so the contents can be without any broken shell. Premium Kitchen Shears, Ultra Sharp Heavy Duty Stainless Steel Kitchen Scissors. The perfect premium kitchen shears have a wide variety of uses. It is designed to cut anything smoothly with the minimal effort, no matter for food, flowers, paper, cardboard, even animal bones. Wusthof Come-Apart Kitchen Shears NIB !! PROFESSIONAL DESIGN, SUPERB QUALITY: Professional design and ultra sharp blades make it feel comfortable, light and effortless while easily outperforming all other shears. It is made from premium, durable, top grade stainless steel that is rust and corrosion resistance. High-carbon stainless steel; tough synthetic handles. Get a clean cloth and wipe down the blades. 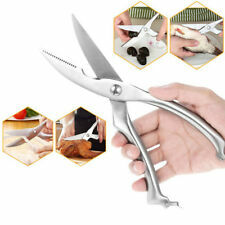 - A pair of multi-functional shears, is used in many parts and makes it perfect to cut up proteins, herbs, vegetables, etc. STURDY HEAVY DUTY STAINLESS STEEL SCISSORS - We devised the optimal blade, and added reinforced hinges, thick casting and strong handles - ready for workhorse cutting and chopping marathons. Handle has helpful jar opener. Can be taken apart for resharpening. Black handle. Fresh out of a factory sealed set. Kitchenaid Kitchen Scissors Shears Allpurpose. The KitchenAid kitchen scissors allpurpose are made with features micro-serrations on the blades for enhanced cutting. These stainless steel kitchen scissors are dishwasher safe. 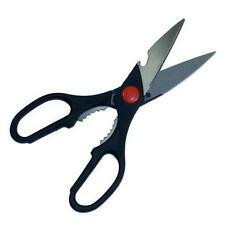 Instead of several different kitchen tools, multipurpose kitchen scissors set can cut anything! HIGH QUALITY AND SHARP BLADES - Made of high-quality stainless steel, The kitchen scissors have longer life. This is a pair of Chicago Cutlery Kitchen Deluxe Shears. These have black handles. ⭐ Multipurpose Poultry Shears Heavy Duty Kitchen Scissors Stainless Steel Bone Shears Spring Loaded Shears With Sharp Blade, Safety Clip, Comfortable Handle, For Fish, Chicken, Beef, Chop Herb. Well, we have the perfect alternative for you! 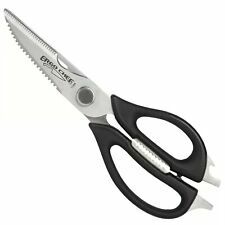 Ideal for every kitchen, these multi-blade scissors are great for cutting all kinds of fresh herbs and preparing salads. May also be used for shredding paper and creating arts and crafts projects. • Full tang blade extends from tip of the knife to end of the handle for added balance and strength for balance and strength. • Triple compression stainless steel rivets secure the handles to the blade. They can also be used as nut cracker, beer bottle opener, and scraper for fish scales. Tackle It All with The Oojdzoo Kitchen Scissors & Herb Scissors Combo Kit! 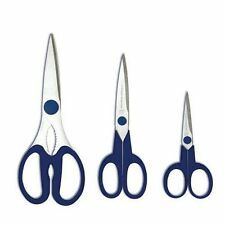 HEAVY DUTY AND SHARP BLADES - Made of high-quality stainless steel, The heavy duty kitchen scissors set have longer life. Good kitchen tool. Each blade features micro-serrations for enhanced cutting performance and are extra thick for added strength and durability. The blades are crafted from stainless steel that resists rusting. Eggs can also use scissors to cut them, so exciting! Placed on the eggs, gently cut, to complete the removal of the egg shell and keep neat incision. Can also be used for other egg dishes, such as eggs that are peeled into the oven. Can also cut shredded paper in the office. 1 5 Layers Scissors. Made from stainless steel, durable for use. Material: Stainless Steel.